If you have integrated with the Barcode Payment (old version) product, read Barcode Payment for details. The barcode/QR Code payment is an offline instant payment solution offered by Alipay for the in-store checkout. This payment solution enables merchants to collect money by scanning the barcode/QR code that is shown on a customer’s Alipay wallet app. The barcode/QR code payment solution is also known as "merchant-scan solution", which is contrary to another kind of offline solution "customer-scan solution" where customers scan the QR code presented by merchant. One great advantage of using the barcode/QR code payment is that it does NOT require Alipay Wallet App has the internet connection. The barcode/QR code essentially identifies the owner of Alipay Wallet, with which Alipay knows which customer's account to be charged for the payment. In addition, the code is auto-refreshed every minute in Alipay Wallet App without requiring the internet connection. The document is intended to be used by developers and administrators that want to use Alipay to collect payment. The customer opens the Alipay app and then presents the Alipay barcode or QR code for checkout. The cashier places an order in the system, and then scans the customer’s Alipay barcode or QR code to initiate a payment request. The payment request is sent to merchant's backend system and then further sent to Alipay for processing. Alipay processes the payment request in realtime, and then sends the result to customer via text message and in-app notification. Meanwhile, Alipay sends the processing result to the merchant by the pre-defined method. Depending on how the merchant integrates with Alipay, a payment request can be sent to Alipay directly, or relayed by the acquirer. After the request is processed, the result will be fed back in reverse order. For security reasons or regulatory requirements, users might be prompted to enter payment password to complete the payment in certain scenarios. In some regions, to improve the efficiency and to acquire more merchants, acquirers are involved in to help merchants integrate with Alipay. A. If Acquirer doesn't have the gateway, a system integrator will be involved to help merchant to integrate Alipay. B. 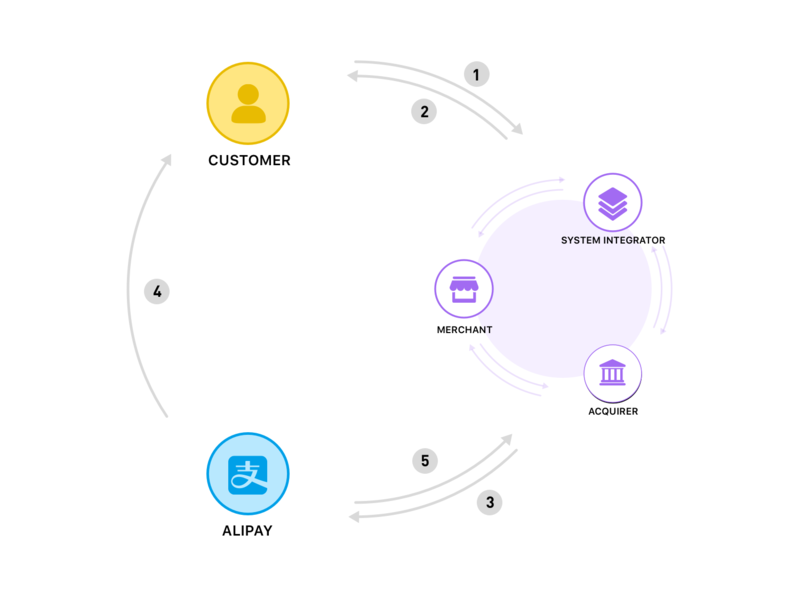 If Acquirer hosts its own gateway and can integrate Alipay for merchants directly, then the system integrator is not needed. C. If Merchant doesn't have the gateway, a system integrator will be involved to help merchant to integrate Alipay. D. If Merchant hosts its own gateway and can integrate Alipay for merchants directly, then the system integrator is not needed.